Here we are, we made it to the final week… week 7 of the One Room Challenge. This was a small project considering some participants did basements or kitchens but it was definitely work and I don’t know when we would have completed this room if it weren’t for the ORC. Thank you to Linda from Calling it Home for running this challenge twice a year… so many inspiring designs out there because of this challenge! 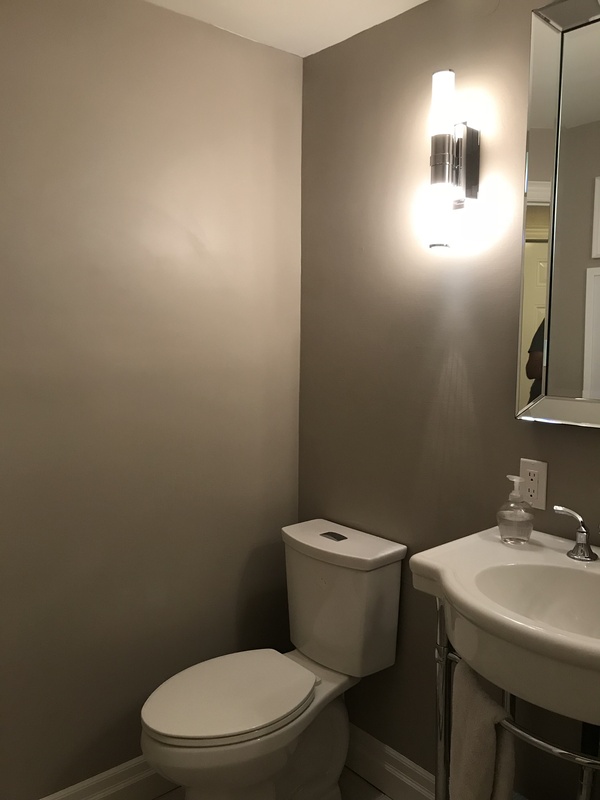 And now this is how it looks…..
My powder room started out as a room with no character and a lot of potential. 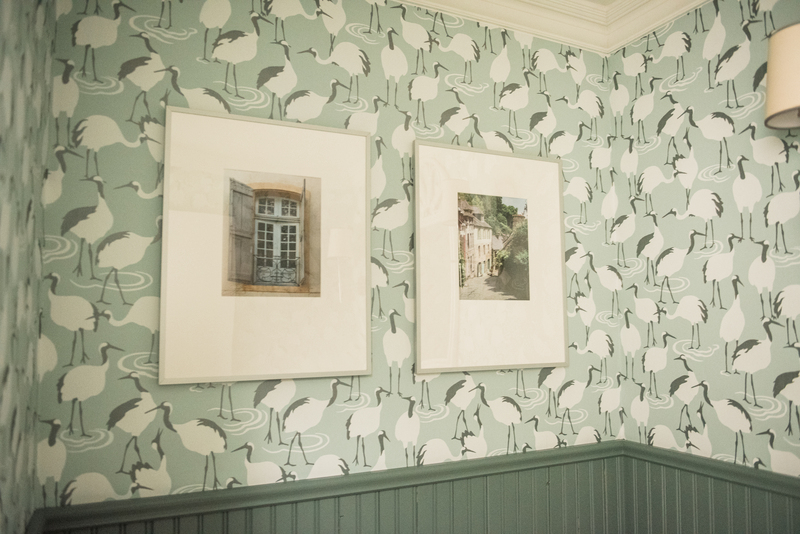 It was our little room that needed some colour and patterns to make a lasting impression. 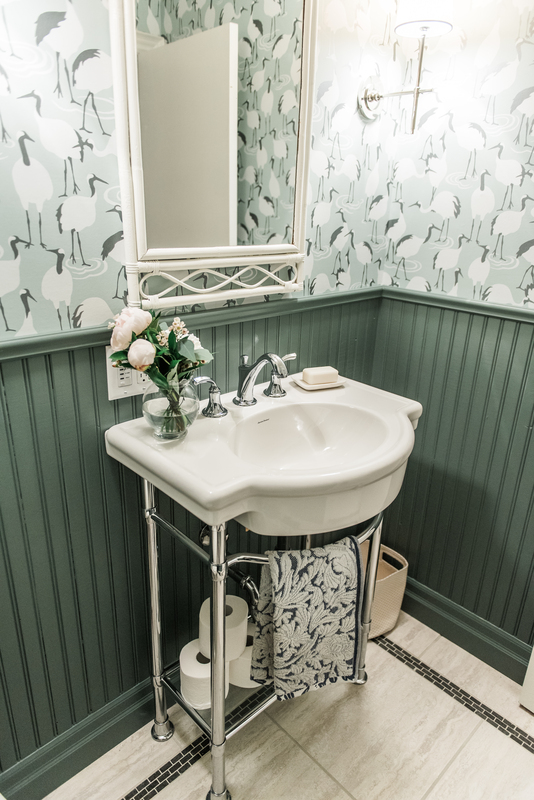 I was always so drawn to the powder room with wallpaper and paneling on the bottom half (see here for the bathrooms that inspired me). 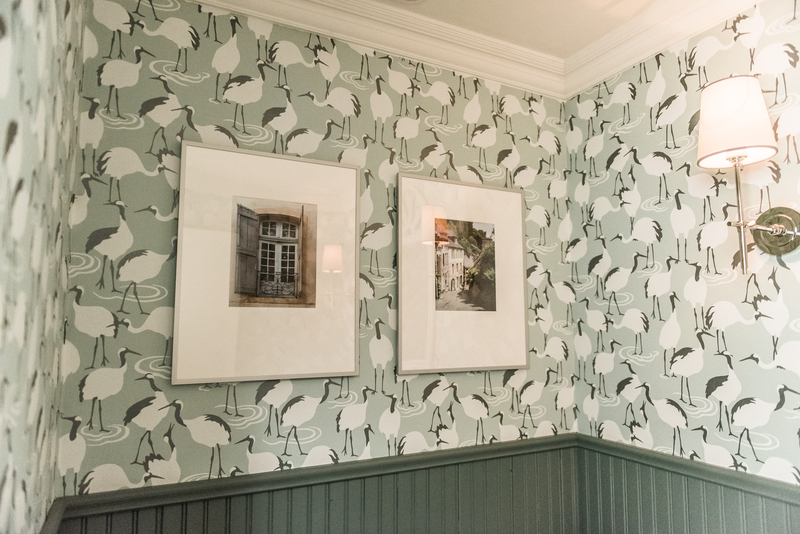 The whole design started off with me browsing through wallpaper online and I found the DwellStudio Winter Crane pattern on Wayfair.. it immediately caught my eye. When I married my husband, we had origami cranes as part of our wedding decor. They are a symbol of happiness and eternal youth – can’t go wrong with that! I knew it was the right design for our young family. After we installed the beadboard (see our DIY tutorial here), I knew I wanted it white but realized it wasn’t going to work (see week 5 for the whole story). 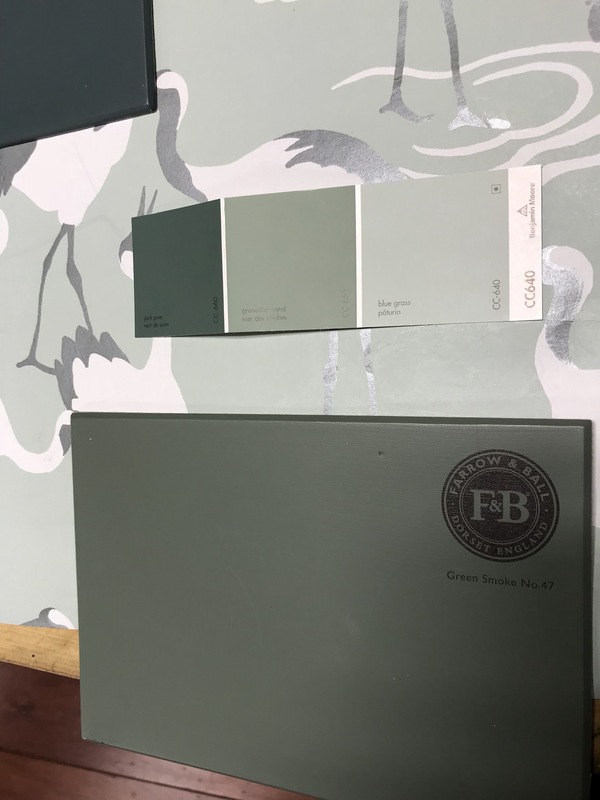 I decided on “Green Smoke” by Farrow & Ball and I haven’t looked back…. It’s not a forest green or a green that blends in with the mint from the wallpaper. It’s enough colour to make a statement but is not too overbearing. My two little boys use this bathroom all the time so I had to be careful with my choices in this room! I couldn’t be happier with the sconces I chose. Again, in week 5, there was a bit of a panic but everything is good nice and they fit perfectly in this room! 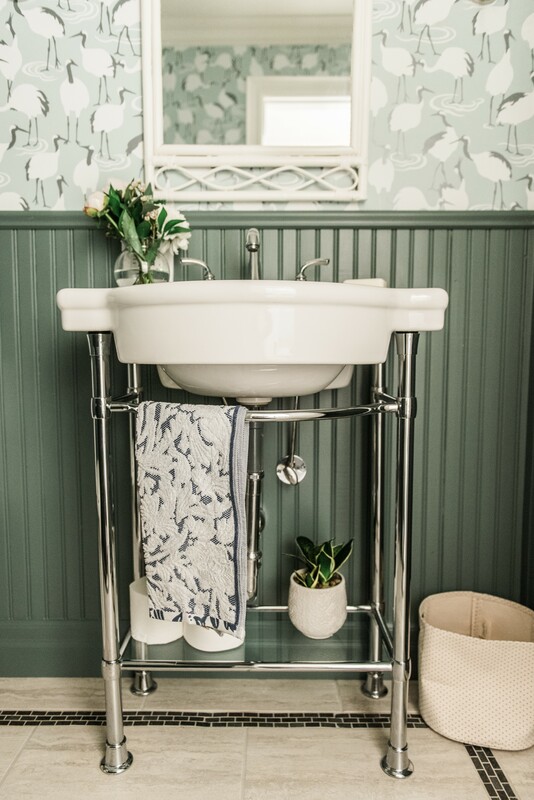 It adds that touch of elegance to the room, one of the many things missing from the old bathroom. Choosing art for the walls was hard because I really didn’t know what I needed to have in there. I was thinking watercolour but it just wasn’t working for me in this particular room. I was talking to one of my good friends about this and she suggested photography. I picked two prints, grabbed a few IKEA frames, got some custom mats, and that’s all that was needed! I just want to say thank you to my husband for doing so much work, thank you to everyone who followed along and left encouraging comments and a big thank you to my friends and family for the support and encouragement! The wallpaper was c/o Wayfair. All opinions and thoughts are my own. Be sure to check out the featured designers for their big reveals and all of the hard-working guest participants! Its so elegant and inviting! You did a beautiful job!! 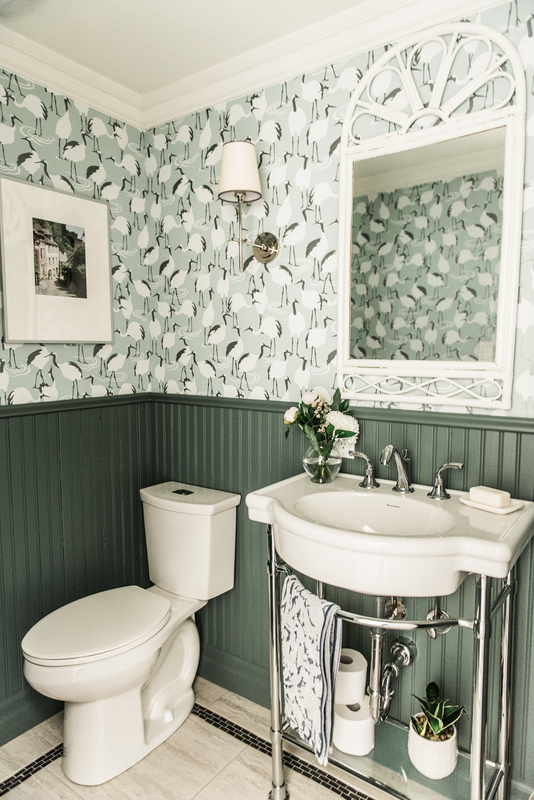 I can’t help but love that combo of beadboard and wallpaper! 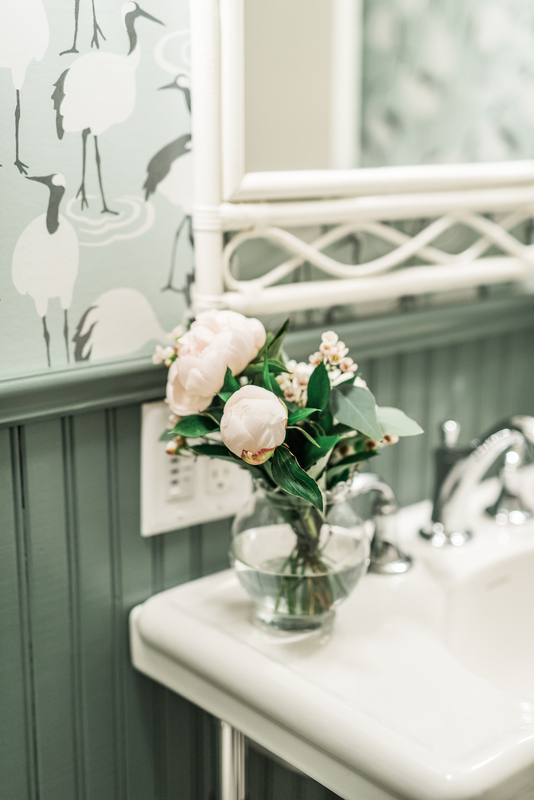 Half way through this challenge I fell asleep wondering if I should ditch my subway tile plan and put green wood wainscoting in the bathroom- no joke! (I didn’t, so I’m grateful to be living vicariously through you now!) Great job! Aw thanks!! Haha really? Too funny! I usually feel the same way.. I usually like to stay with what I know that I like so to pick a colour for the beadboard was scary!! 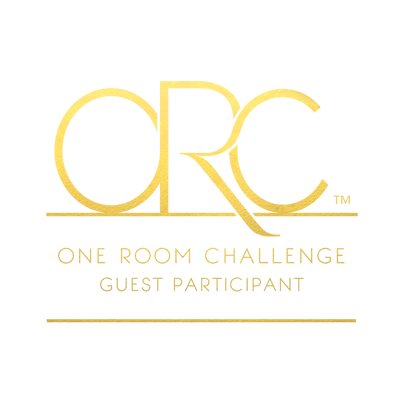 Heading over to your blog to see your reveal! oh I LOVE your wallpaper! so serene and still playful … and of course I love crane, so it’s a natural home run for me. Love that you have pulled the green from your wallpaper as paint for the wainscoting. The room looks so coherent, especially with that little band of green mosaic tiles on the floor! Thank you, Tim!! I really appreciate it. So glad you love the wallpaper as your wallpaper choices are amazing. So glad you noticed the mosaic tiles, they definitely now fit in the room! Thank you! Yes.. Green is hard to pull off, I was scared but so glad I went for it! Great job! Love the crown moulding too! Wow! What a difference. 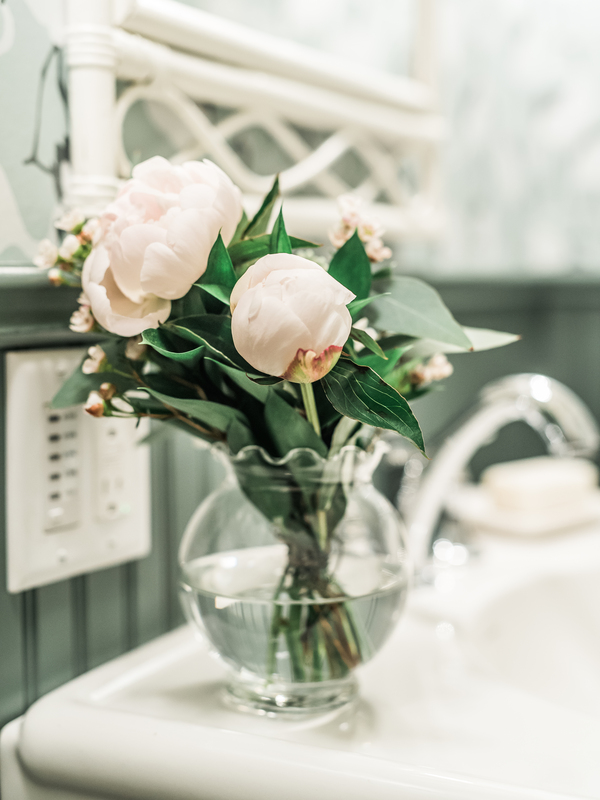 Your new powder room looks amazing. Great job. Aw thank you!! Definitely quite the difference! 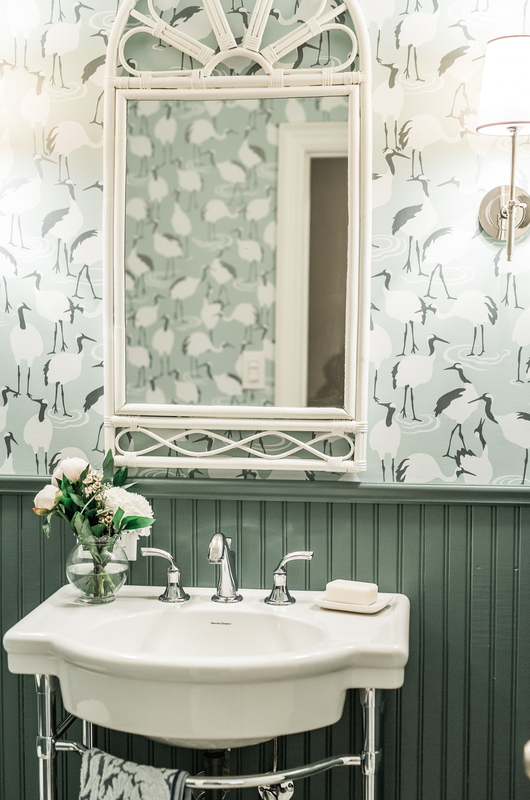 Your lovely paint and wallcovering choices have transformed this powder room from standard to stunning. Congrats to you and your husband on a job well done. What a huge difference! This little room packs quite the punch! Looks beautiful. Ooh ooh ooh! Love the cranes and the deep sage green. 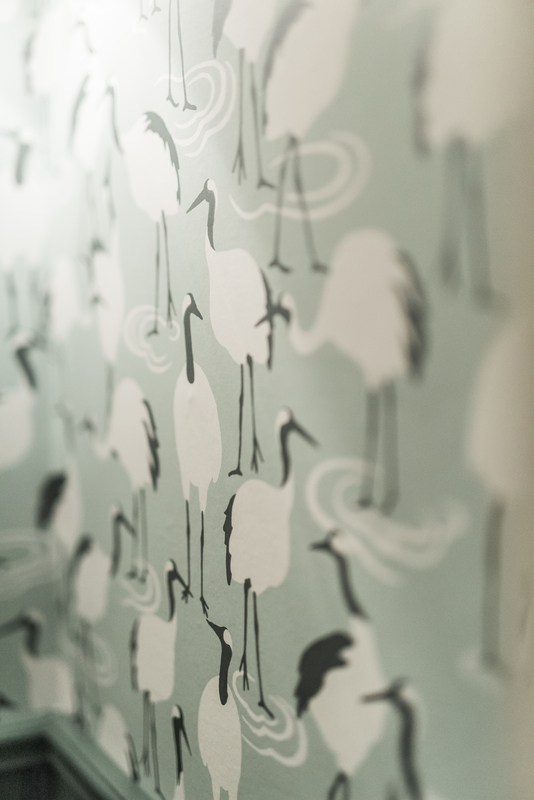 So fun that the crane wallpaper has a personal meaning for your family too! Great job on the ORC. 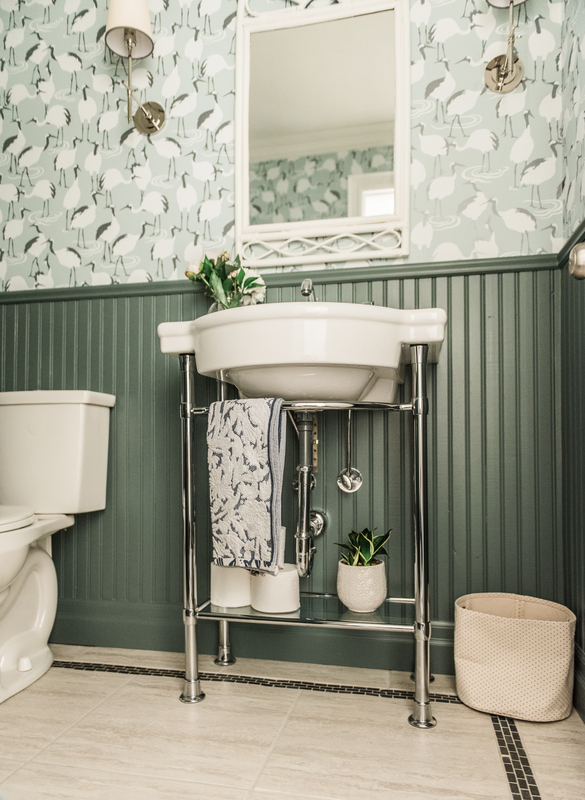 The wallpaper paired with the green bead board is so fabulous. What a difference!! Great job! 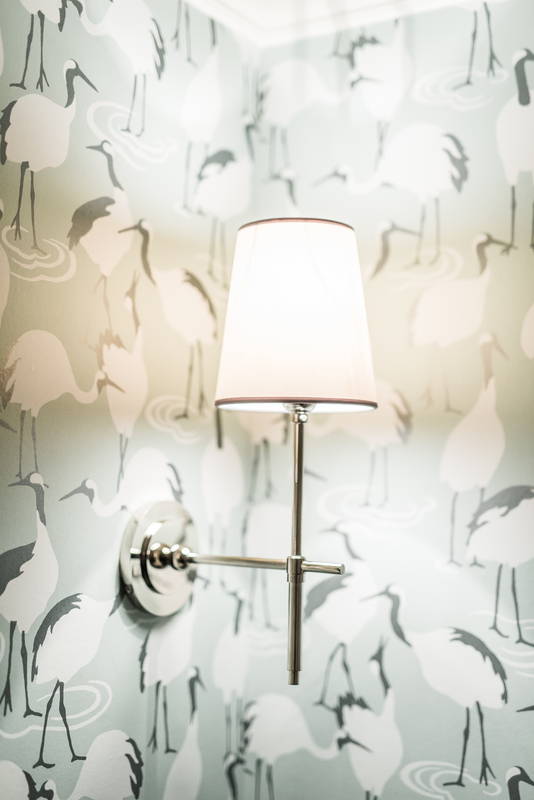 Oh my goodness, the green bead board, with that white crane paper and the delicate wall sconces is SOOOOO dreamy. Such a pretty design! You did such a great job! Love the wallpaper and the GREEN! Congratulations. Thank you! So glad you love it! 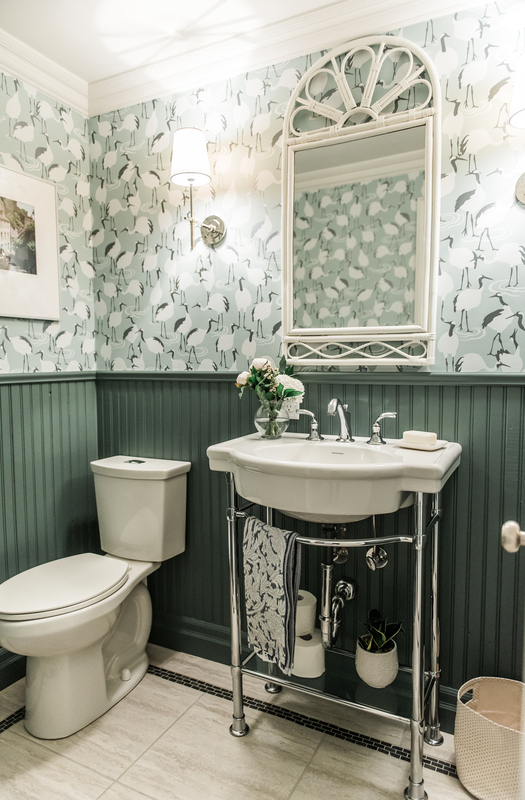 Love that wallpaper you chose for your Powder room and the overall design of this space! Congrats and Cheers to us for another room done! Thank you!! Glad you liked it! Wow! I love the wallpaper and your color choices and the sconces. Nice job!!! This looks amazing! I’m a little late to the party but love all the choices and the beadboard colour is definitely the highlight (and the sconces)!